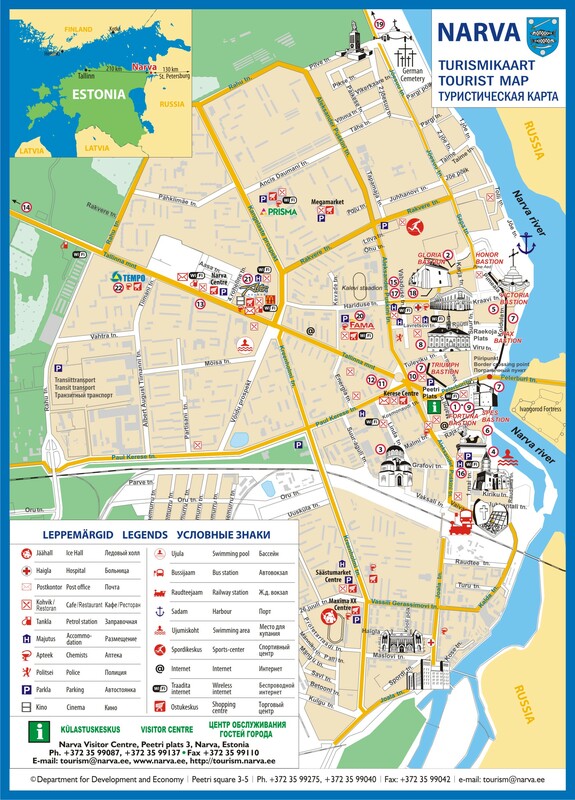 The frontier location of Narva is the most distinctive feature of the past and the present of the town. By the Middle Ages the historic border has been already running there, along the banks of rapid river swiftly flowing its waters out the Lake Peipus into the Baltic Sea and dividing the two civilizations – the Catholic European North and Orthodox Slavonic East. The history had materialized in Narva in its architectural ensemble, uncommon beauty and dramatic effect. The integration of the opposites is unique in the whole Europe. Two giants of stone, towering in close vicinity to each other on two opposite banks (at distance of an arrow flight or that of a musket shot) - the castle of Order of Germanic knights and the Russian fortress of Ivangorod. Despite the opposition in the architectural approach, these two fortresses make up an integral ensemble. Narva bastions have always been the main attraction of Narva town as well as Narva castle. For a long time the Bastions kept their mysterious secrets and rich history behind the thick walls of the casemates. These mighty fortifications could be watched only outside, meanwhile the casemates stayed unavailable for visitors. Now Victoria bastion is ready to share its secrets and let all interested into its previously closed tunnels. The exposition inside the tunnels is introducing the history of the bastions, starting from the date of the establishment, several centuries ago, till nowadays. One kilometer long Narva river promenade is stretching along the Narva River from the river port till the castle. It’s one of the main places of attraction for both Narva visitors and citizens. In any weather people walk there, go fishing and do sports, as the promenade perfectly suits for leisure time with family, rollerblading and cycling. There are also interesting objects on the promenade. For example, Swedish terrace with lion figures, stage of Dahlberg for performances on the open air, the Sun Square, where you can find a Sun Watch, summer cafe, and a fountain. Alexander´s Cathedral was built in the late 19th century and named in honour of the Russian Emperor Alexander II. After the WWII, the Church bell tower was totally destroyed and reconstructed only in 2008. Cathedral of the Resurrection of Christ is an Orthodox church built in Byzantine style in the late 19th century upon the project of the architect Pavel Alish. During the battles of 1944, when most of Narva was destroyed, the church survived and still in use today. The cathedral also has two miracle-working icons: Saint Nicolai and Mother of God icons. In only 14 kilometers from Narva, on the coast of the Gulf of Finland, is located Narva-Jõesuu, small and cozy spa town. Since the beginning of the XIX century it grew into a favorite place for the Saint-Petersburg aristocracy. In our time there are health recovery center, hotels, holiday homes, which are offering a restful and relaxing holiday to thousands of visitors.